The joy of approaching summer always makes me think of color, and color makes me think of Impressionism—American Impressionism in this case. The Ten American Painters group was formed in 1898 by American artists who had adapted the Impressionist style. At the time, it was not well received in the realism-obsessed “official” American art academies: the National Academy of Design (founded 1825) and the Pennsylvania Academy of Fine Arts (founded 1805, Philadelphia). These academies were oriented on the European model of Neoclassicism-based art education. Naturally, when the Ten American Painters group formed in opposition to the academies’ rejection of Impression—much in the same vain that the original Impressionists formed the Salon des Refusés—they did not invite any women, such as Mary Cassatt (1844–1926). Cassatt was back and forth between Paris and Philadelphia at the time and her work was featured in the Women’s Pavilion of the 1893 Columbian World’s Exposition in Chicago, surprise, surprise. Many American women artists adapted the Impressionist style aside from Cassatt, and I am presenting three of these artists to you. Although Impressionism had run its course as a “revolutionary” style by the first decade of the 1900s, many artists persisted in this style. It gradually spread to the West Coast in the late 1910s after the Panama Pacific International Exposition in San Francisco introduced French and American Impressionists’ works. The California Impressionism painting movement, often called the Plein Air Movement, developed, although many of the artists were not native to the state. Fern Coppedge (1883–1951) was born and raised in Decatur, Illinois. At thirteen she moved to California with a sister and became interested in painting for the first time. She studied watercolor and, even though the California Impressionist movement had yet to coalesce, she became interested in reflections of sunlight on snow and water. Returning to the Midwest, she studied at the School of the Art Institute of Chicago. She also studied under American Impressionist William Merritt Chase (1849–1916) at the Art Students League in New York. 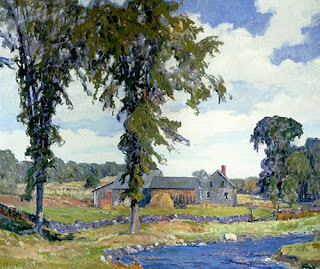 Key to her development as an Impressionist was her move to Philadelphia in 1917 to study at the Pennsylvania Academy of Fine Arts, where her mentor was the American Impressionist Daniel Garber (1880–1953). By that time, the Pennsylvania Impressionist movement had become a phenomenon. Coppedge was active summers at the New Hope art colony, which was home to many Impressionists. She was a member of the influential women’s art group The Philadelphia Ten from 1922 to 1935. Many of the members of that group also painted in an Impressionist style. Coppedge is most famous for her snow scenes in Bucks County, Pennsylvania, which she always painted outdoors, often with her canvas lashed to a tree or from the back seat of her car. This painting of Gloucester comes from summers spent at the Rocky Neck Art Colony there, the oldest art colony in the US. 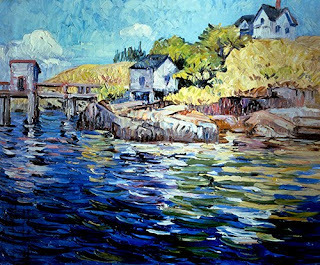 Rocky Neck was a haven for many American Impressionists, including Childe Hassam (1859–1935), Celia Beaux (1855–1942), and Frank Duveneck (1848–1919). Harriet Lumis (1870–1953), born in Connecticut, was initially discouraged from painting by her parents. After marriage in 1892, she began formal painting lessons under Willis Adams (1848–1921), a landscape painter in the Barbizon-Realism style. Her first landscapes were in the Tonalist tradition, which means an interest in light and atmosphere within the traditional academic landscape palette of greens, yellows, and browns. 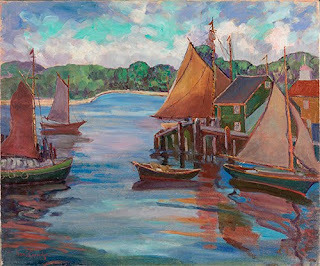 This changed after she studied under the Impressionist Leonard Ochtman (1854–1934), who was one of the founders of the Cos Cob art colony in Connecticut, a hotbed of American Impressionism. Ochtman had studied with Dutch Tonalists Anton Mauve (1838–1888) and Jacob Maris (1837–1899), and then in Paris where his work was influenced by the airy, lyrical landscapes of Jean-Baptiste-Camille Corot (1796–1875). After studying with Ochtman, Lumis’s palette lightened and she changed her approach to landscape from broad vistas to more intimate snapshots of nature. Lumis was one of the founding members of the Springfield (MA) Art League in 1919. This work from the 1920s demonstrates how, as time went on, her approach became looser in brush work, yet still firmly rooted in sound composition. Helen Hamilton (1889–1970), the daughter of academic painter Hamilton Hamilton (1846–1928), showed artistic talent at a young age. Like Coppedge, the California Impressionism movement was in a nascent period when she moved there in 1908. She received training from her father there and early on was interested in landscape, practicing in the Sierra Madre Mountains. She gradually became interested in Impressionism. In 1910, she moved to New York where she took lessons at the National Academy. Hamilton’s family also had a house in Silvermine, Connecticut, home to a thriving art colony since 1908. Hamilton spent much time there, where, among the many styles explored, Impressionism was coming to the fore. Silvermine artists (although not including Hamilton or her father) exhibited in the landmark 1913 Armory Show in New York, where Helen saw thirteen of Vincent van Gogh’s (1853–1890) works. Judging by this work, van Gogh had a lasting influence on her painting. As Hamilton’s style evolved after World War I (1914–1918), color became more important to her than subject matter. That is obvious in this luscious painting where she has delighted in laying down thick layers of pure color, probably with a palette knife. Hamilton was renowned for her works involving reflections in water and her loosely painted snow scenes. What Do You Think of When I Say “Porcelain”?